Illustrated flowers represent each loved one's birth month, creating a beautiful bouquet of your family. Like a well-tended garden, your family's unique "blooms" come together to create a beautiful bouquet. 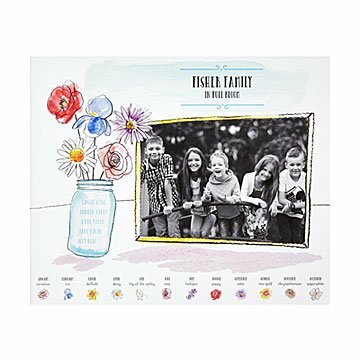 This personalized photo art celebrates that, with a favorite photo paired with illustrated flowers representing each family member's birth month (a helpful key is printed at the bottom). Add names and birthdates, too, then give the sweet keepsake to the loved one who knows the best gardens (and families) take nurturing, attention, and plenty of sunshine. Illustrated by Patricia Carlin. Printed and framed in Oregon. Also check out our A Grandma is Born Photo Art. Like a well-tended garden, your family's unique "blooms" come together to create a beautiful bouquet. This personalized photo art celebrates that, with a favorite photo paired with illustrated flowers representing each family member's birth month (a helpful key is printed at the bottom). Add names and birthdates, too, then give the sweet keepsake to the loved one who knows the best gardens (and families) take nurturing, attention, and plenty of sunshine. Family In Full Bloom Photo Art is packaged in a partially recycled and fully recyclable/compostable box. There's one place—and only one place—where you'll find the Family In Full Bloom Photo Art: UncommonGoods. Framed prints come with Plexiglass, ready to hang. Customization accommodates both vertical and horizontal customer submitted photos.